William R. Bliss : Waikiki, 1873. Paradise in the Pacific : A Book of Travel, Adventure, and Facts in the Sandwich Islands. Sheldon and Company, New York, 1873. This has an extended report of life at Waikiki, but has no surfing content. The favorite ride is to Waikiki. at odd times of the year. It is not a gay watering-place. Its local excitements are caused by the activity of the insect tribes, and the occasional fall of a cocoanut. But to the wearied dweller in Honolulu, to whose year there comes no variety of seasons, fashions, or faces, Waikiki is "somewhere to go." Here he celebrates his birthday by a picnic with his friends. Here, when school does not keep, he brings his children for a romp and a bath, and a hunt for shells along the shore ; and here he sometimes comes alone to enjoy nature and the natives. Under these trees are a few grass huts and wooden shanties, occupied by natives ; and under them, also, straggles the line of unpainted cottages, which is Waikiki. The architecture of these cottages is of the sudden, spasmodic style, indicating daily diversities of mind in the same individual. They stand so near to the shore, that the front-door is necessarily on the back-side, which our carriage must approach by a wandering by-road. broad porch, made of reeds woven upon a frame, which shuts out the glare thrown up by the sun from the sea ; but it can not shut out the mosquitoes that come with the gloaming, whose visits are the sharpest ills of life. Here is indolence all around us. It is exemplified by those native men and women, lounging in scanty raiments on the grass, playing cards, and talking idle tattle, all day long. What specimens of human grossness and laziness! Even a silver coin is slow to induce a native boy to climb a cocoanut-tree, and throw down some nuts for us. The sand on this shore is lava, coral, and shells, pulverized by the sea, and bleached by the sun. Wild vines, bearing flowers, are running over it as if it were a garden soil. the stump of an ancient volcano, whose southern slope is seven hundred feet high where it juts into the sea. Yonder, in front of us, is a coral reef, against which the ocean is always breaking with a moan, as if it were weary of its long endeavor to destroy the barrier. Naked natives are searching in the water for shell-fish to eat ; and others are paddling swift canoes, balanced by outriggers, through the surf. A company of men and women are wading toward the land, dragging a sweep of palm- leaves, in which they expect to strand a skip-jack or a mullet. The swell which rolls over the reef comes up gently to the edge of the shore where we are standing, "Kissing the sands, and whispering at our feet, With exquisite advancement and retreat." A bath in this summer sea is delightful. pleasantly warm ; its temperature being about seventy degrees. Once in, I am reluctant to leave it. But can we not come again to-morrow ? 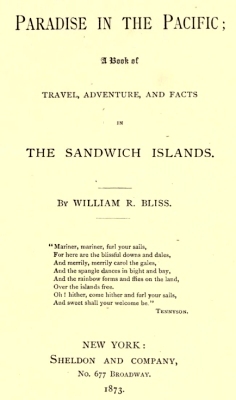 A Book of Travel, Adventure, and Facts in the Sandwich Islands. Geoff Cater (2012-2014) : William R. Bliss : Waikiki, 1873.